In March 1878, Constable Fitzpatrick went to the Kelly household without a warrant after supposedly getting drunk and attempted to molest Ned’s younger sister, Kate Kelly, and reportedly attacked and bullied all of the Kelly family members present (Seal, 152). Mrs. Kelly, Ned’s mother, was put on trial for attacking a police officer and with Fitzpatrick’s questionable evidence, was severely sentenced to three years in Pentridge (Seal, 152). The local community saw the Kellys as victims of police harassment. The Kelly brothers, Ned and Dan, fled to the bush along with friends Steve Hart, Joe Byrne, and Tom Lloyd. The police went after them at Stringybark Creek where a gunfight erupted ending in three dead policemen (Seal, 152). Under the law, the Kelly Gang could have legally been shot on site by anyone (Seal, 152). While on the run, local members of the community would assist the Kelly Gang with housing or supplies and in January 1879 the Victorian police arrested thirty suspected Kelly sympathizers (Seal, 154). Many sympathizers supported the Kelly Gang because they were the underdogs and took every chance they could to strike at their enemies’ resources in a Robin Hood fashion (Seal, 55). The Kelly Gang would rob banks in small, sleepy towns like Euroa and burning mortgages in an almost public manner (Seal, 55). All of the women who were present during the raids said they were treated with “great respect and civility” (Seal, 156). The press also contributed to the growing Kelly support by depicting them as a gang that “raged against the ineptitude of the police” (Seal, 156). The last act of the Kelly saga occurred at Glenrowan railway station where Ned Kelly and the gang attempted to derail a police train in June 1880 (Seal, 159). The four bushrangers spent the night at the Widow Jones’ Glenrowan Inn with approximately 60 hostages (Seal, 159). The gang mistakenly let one of the hostages go, schoolteacher Thomas Curnow, after he told Ned Kelly he was worried about his wife and family alone at night. Curnow left the inn and proceeded to warn the police of the Kelly Gang’s plot (Seal, 159). With homemade iron armor created from stolen or donated ploughshares that weighed over 100 pounds, Ned Kelly seemed impervious to the police squads’ bullets (Seal, 159). Ned Kelly was eventually brought down by a shotgun blast to the legs, the only part of his body not protected by the armor, however “Ned Kelly once again refused to do what was expected of him and remained alive (Seal, 60). Ned Kelly was then taken to Melbourne the day after the siege where he was to stand trial (Seal, 160). Going into the Central Criminal Court on Russell Street in Melbourne, I felt like a member of the jury for Ned Kelly’s case, vaguely aware of these facts but still on the fence as to which side I was on—Ned Kelly’s or the Victoria authorities. On October 28th 1880 Ned Kelly went to trial for the murder of Constable Thomas Lonigan (Corfield, 472). After Ned Kelly was captured at Glenrowan he was taken to Beechworth where his first hearing was his on August 6th 1880. Charles Smyth and Arthur Chomley were chosen to prosecute on behalf of the Crown under the instruction of Henry Gurner. Lawrence Zincke was the original defense lawyer chosen by the Kelly family to represent Ned, but David Gaunson was subsequently chosen—the same man responsible for organizing meetings and a petition of 30,000 names to pardon Kelly (Corfield, 176). Gaunson was an aspiring lawyer and politician who some believe was not planning to act in the interest of his client, but to further his own political career (Corfield, 177). Gaunson’s main defense for Ned Kelly was mistaken identity, rather than the logical notion of self-defense (Corfield, 177). In the weeks leading up to the trial, Gaunson sent his brother William to liaise with Ned Kelly, rather than meeting with his client himself. Gaunson never went to see Ned Kelly after the trial and disappeared from the campaign against Ned Kelly’s execution (Corfield, 178). Henry Bindon was chosen to represent Ned Kelly at his trial in 1880, although Bindon was not even in Australia for most of the Kelly Outbreak and thus knew less than most local Victorians about the case. It is common belief that the decision to have Bindon as a lawyer for this huge case when he had never previously appeared in High Court was a ploy to receive further postponement of the trial (Corfield, 63). The only other explanation for the election of Bindon as Ned Kelly’s lawyer was to ensure his failure and thus Ned Kelly’s conviction. One of Bindon’s main mistakes in the trial was having Ned Kelly’s Jerilderie Letter, the letter in which Ned Kelly offers his version of the events at Stringybark Creek where three policemen were killed in October 1878, ruled inadmissible in court (Corfield, 63). The letter was ultimately thrown out of court because it was a police copy, not the original (Corfield, 64). In the Jerilderie Letter, Ned Kelly claims self-defense for the murders saying: “If Ned Kelly was to be shot he was the man would shoot him and no doubt he would shoot me even if I threw up my arms and laid down as he knew four of them could not arrest me single handed not to talk of the rest of my mates, also either he or me would have to die, this he knew well therefore he had a right to keep out of my road” (Corfield, 242). Ned Kelly was the only known bushranger to have left behind a detailed justification of his actions (Weber, 62). Bindon was essentially just inexperienced—Ned Kelly was reported to have said: “Mr. Bindon knows nothing about my case”—along with the judge, Sir Redmond Barry who was determined to find Ned Kelly guilty (Corfield, 64). Ned Kelly was found guilty of murdering Constable Lonigan at Stringybark Creek and he was hanged at Melbourne Gaol on November 11th 1880 (Weber, 60). By the end of the court reenactment, when the judgment was read in the court, I found myself shouting along with the rest of the viewers “Justice be damned.” The moment before Ned Kelly’s was hanged the convicts in the cellblock howled showing their last respects to Ned Kelly (Jones, 323). When the hood was removed from the lifeless head of Ned Kelly he was reported to still have “a most life-like appearance. The features were undisfigured, and their expression was one of remarkable placidness [one man would speak of ‘his smile in death’] while the eyes wore a bright expression” (Jones, 324). 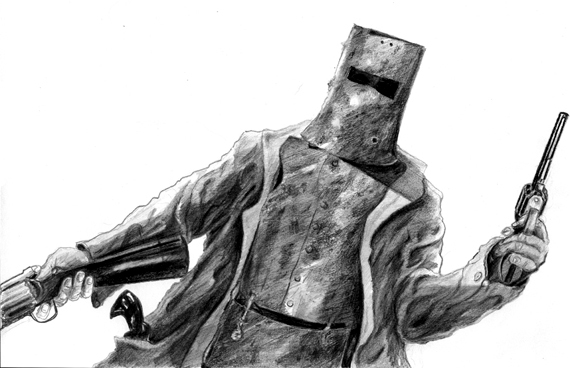 I couldn’t help but fall in love with the romanticized legend of Ned Kelly. He is seen as a man who was victim to circumstance and a corrupt government. A man who reportedly smiled in the face of death, fashioned armor out of iron over tree trunks to create what would become iconic armor, and had enough courage to tell the judge who sentenced him to death “I will see you there, where I go” stands for something larger than just a dissident—he can be considered a hero to all who have faced injustice on any scale (Jones, 325). I believe what people admire is his bravery and sheer willingness to fight against the oppressed life he was forced to live. Ned Kelly is seen as a national hero to many Australians and perhaps even people all over the world who know his story. His immortality is an astounding feat for any historical figure and arguably has shaped Australian history, transforming from outlaw to hero and “icon of romance and adventure of the pioneering past” (Seal, 147). His story has influenced countless films, documentaries, television mini-series, ballads, plays, radio dramas, and even high art in the form of Sidney Nolan’s famous Ned Kelly series (Seal, 172). He continues to have relevancy in the modern world with a “seemingly eternal audience” because of his “daringness, bushmanship, and sheer style” (Seal, 170). Now the story and the concept of the outlaw Ned Kelly is celebrated, rather than Ned Kelly, the murderer. Ned Kelly is particular appealing to youth, who are rebellious by nature, and in a nation built by oppressed convicts, who else could be considered a hero but bushranger and outlaw Ned Kelly? Ned Kelly is depicted as harmless as if he was one of your crazy mates with facts like: “the gang always socialized with their captives, drank with them (at the bushrangers’ own expense, it seems), danced, sang, and played party games with them, and generally gave everyone a roaring good time” (Seal, 164). The Kelly Gang truly seemed like decent gentleman in the sense that they would not kill and plunder indiscriminately or without just cause, “showing courtesy and generosity to women and the poor” (Seal, 164). Ned Kelly and his gang embodied the “spirit of mateship, sacrifice, and courage” (Seal, 174). As ‘Smiling’ Billy Blankhorn sang—and I tend to agree—“I think to myself, perhaps after all—old Ned Kelly wasn’t such a bad guy” (Seal, 169).